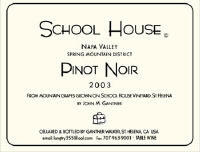 School House Vineyard is located on Spring Mountain above St. Helena at the intersection of Langtry and Spring Mountain Roads. The vineyard was named after a one-room 1890s schoolhouse on the property which was destroyed by fire in the mid 1980s. The original vines, a mixed field blend, were planted in the 1890s and all of the grapes were blended into a single red table wine. Today some of the vines have been replanted to produce School House Mescolanza, a modern interpretation of the field blend. John Daniel, owner of the Inglenook Estate, gave his friend, John Q. Gantner some Pinot Noir bud wood (said to be from Domaine Romanee-Conti) and Gantner planted the Pinot Noir in his School House Vineyard in 1953. 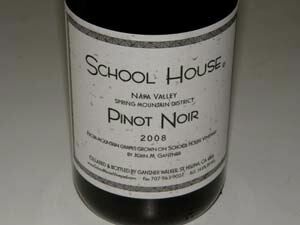 The first School House Pinot Noir was released in 1957. Chardonnay was planted in the School House Vineyard in the late 1960s, using bud wood from Fred McCrea’s Stony Hill Vineyard. The non-irrigated vineyard is located in a cool and unique microclimate at 1,500 foot elevation with well-drained soils. Currently, John M. Gantner and Nancy Walker farm the vineyard and live on the property. The School House wines are vinified at Pride Mountain Vineyards under the direction of winemaker Bob Foley and his assistant, Romel Rivera. The wines are sold primarily through the website. These are historic and quite distinctive Pinot Noirs which deserve every Pinot enthusiasts attention, even considering the high price.